Too much stress, not enough balance? Does this look like maximum productivity? 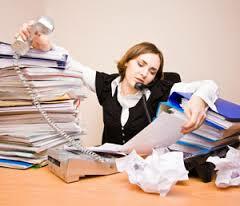 Smart employers know that too much stress reduces performance. A distant ancestor running from a sabre tooth tiger, or an office worker preparing for a big pitch to a client, will both be stressed: The mind & body are on full alert, the blood is pumping, the adrenaline flowing and heartbeat racing. This helps us feel alive, and some feel this is when they perform best. However, being under stress non-stop for weeks/months/years (it’s been a long, hard recession for many!) means that sooner or later there will be a significant drop in performance, and that tiger/presentation is going to get the better of them – leaving our exhausted ancestor dead, and our beleaguered office worker even more stressed, worrying about ramifications from their employer, and in danger of illness, depression and anxiety. Many of us still believe it is perfectly logical to think that more is always better – “I should work harder for longer, eat lunch at my desk and spend my evenings emailing from my work phone”. Some employers and managers demand just that, and although they’re becoming increasingly out-dated as we approach a new era, it’s such an entrenched mind-set that the process of change is slow: Most of us probably already know that for maximum performance we should take a break at least every 90 minutes, but how many of us and our employers actively promote balance in our daily working lives? What’s reducing productivity and what does wellbeing mean for business? It’s also easy to appreciate that performance levels for staff who do not take sick leave can also be significantly affected by all of the above. 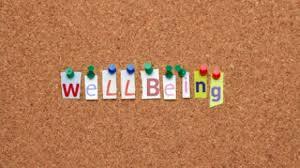 All this means that staff wellbeing can have a major impact on the performance of any business. In medicine there is an increasing awareness that almost all illnesses and diseases are psychosomatic, that is they involve the mind (psyche) as well as the body (soma). I (and countless others) know from personal experience that mental factors can worsen/cause lower back pain, which can form a negative feedback loop that spirals out of control and lead to long term sick leave. Today more and more patients are being treated as an individual whole; so if you have a painful back it’s increasingly likely that the instead of simply being prescribed painkillers or surgery, you’ll also be asked about what else is happening in your life and be offered help in any other areas you are experiencing difficulties. Treatment of the whole person, mind and body, instead of just the symptoms can be much more effective! Now we are seeing an explosion of interest in health & wellness at work. Studies have already demonstrated that wellbeing initiatives at work reduce sick leave and increase productivity & profitability, and more studies are underway – the UK Green Buildings Council are underway with a major project to measure the relationship between health & wellbeing and productivity. Yin Yan yoga improves staff wellbeing, satisfaction & productivity! In 10 years of chronic back pain I’ve tried everything – too many pain killers and anti-inflammatories to mention, anti-depressants, surgery through my abdomen to insert an artificial disc in my spine, osteopathic treatments, massage, physio, acupuncture, and so on and so forth. In all my experience I am clear that that regular yoga practice has been and still is by far the most effective tool – it is all I need to take control of my symptoms, I am more focused and effective in everything I do, I don’t get too stressed, and I enjoy & appreciate life more than ever. I had a fairly typical conversation with a new client recently in Liverpool: They were interested in how Yin Yan could help their organisation and as we got talking it became clear that this person loved their job and was working very hard for their employer, but was also stressed and had no idea how to relax. Similar conversations have revealed that some companies are worried about the mental health levels of their staff, and some companies just know that happy staff are the best staff. Yin Yan helps all of these businesses and their staff. That is why Yin Yan exists and why I can’t wait to share it with as many of you all as possible! So whether you or a group of friends/colleagues interested in attending a public yoga class in one of our pop up studios; you’re an employer interested in a dedicated class for your staff to improve wellness and team dynamics; or you’re a commercial landlord or property asset manager wanting to reduce empty property costs and increase footfall to a vacant office/industrial/retail unit – Yin Yan is here to help people just like you!